Sri Lanka, named Ceylon during British colonial rule, is an island nation off the southern tip of India. Remarkably, it is the world’s 4th largest exporter of tea. The Maldives, unlike Sri Lanka’ single landmass, is a group of islands in the Indian Ocean. Holland America Cruises is taking me to the Maldives, one of my bucket list destinations and I’m incredibly excited. This post is the third, in my series of four articles about the Maasdam Cruise to Southeast Asia on Holland America. Links to the other posts are at the end of this post if you want to read more. Here is a snapshot of what I saw on my adventure. These ports aren’t in order, but it gives a taste of the lands I saw and my trip. Please note that time in each port is minimal, so excursions, at best, provide only a glimpse of the location’s culture. Colombo is the capital of Sri Lanka. It’s in the Indian Ocean and has a population of about 5 million people. It is the largest city on the cruise. The town offers few surprises. We saw people playing soccer and cricket during our visit, and I thought it is serendipitous to see the local people playing the games in Viharamadevi Park because soccer and cricket are the national past time. 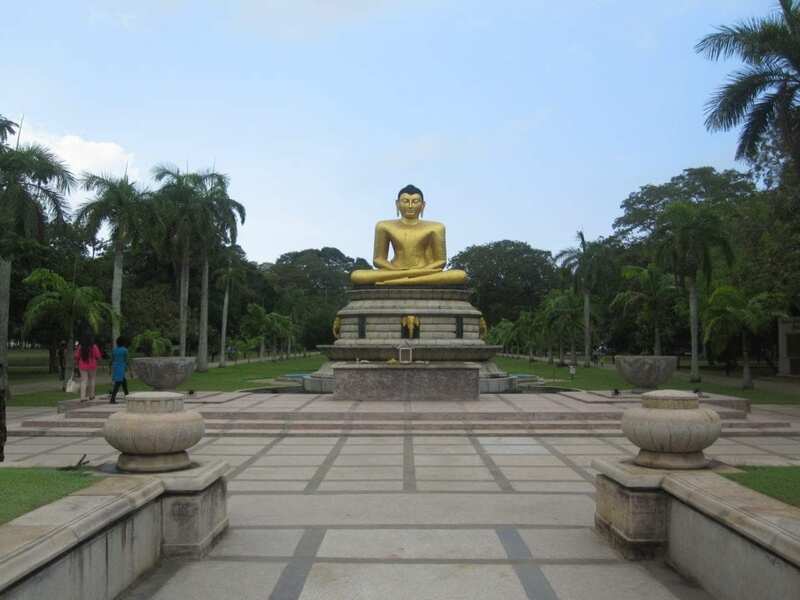 Viharamadevi Park in Colombo, Sri Lanka. Colombo’s largest park and a great place to beat the heat. The three tours I recommend are Pinnawela, an elephant orphanage, Galle, a UNESCO site, and the Handunugoda Tea Estate. All three, especially, Pinnawela and Galle, received excellent reviews. The Handunugoda estate is the only producer of Virgin White Tea in Sri Lanka, one of my favorite teas. Our group stopped at the Pettah Floating Market and the Old Parliament building. On tour, we also visited several temples including the Gangarama Buddhist Temple. The Buddhist Temple’s museum displays religious artifacts from around the world. After the trip, at Viharamadevi Park, we took some time to stop and relax on a hot day. The ship’s tour buses and excursion also stop here. On Sri Lanka’s east coast is Trincomalee. The locals call it “Trinco.” If you ever find yourself there, visit Fort Frederick, initially constructed by the Portuguese in 1623. Both the Dutch and British colonized and occupied the fort. After that, visit Nilaveli beach and watch the locals enjoy swimming in the Indian Ocean. The water is very blue and clean, and we enjoyed the beach! I recommend taking the ship’s tour called “Sun, Sea, and Sand.” It is $129.95 for six hours. The excursion takes the guests to remote beaches. The highlights are sheltered coves and sandy beaches on the east coast of Sri Lanka. A fellow passenger shared with me that the tour stops at a gorgeous resort, where guests enjoyed an elegant lunch. This tour is an opportunity to enjoy Sri Lanka’s resort experience. 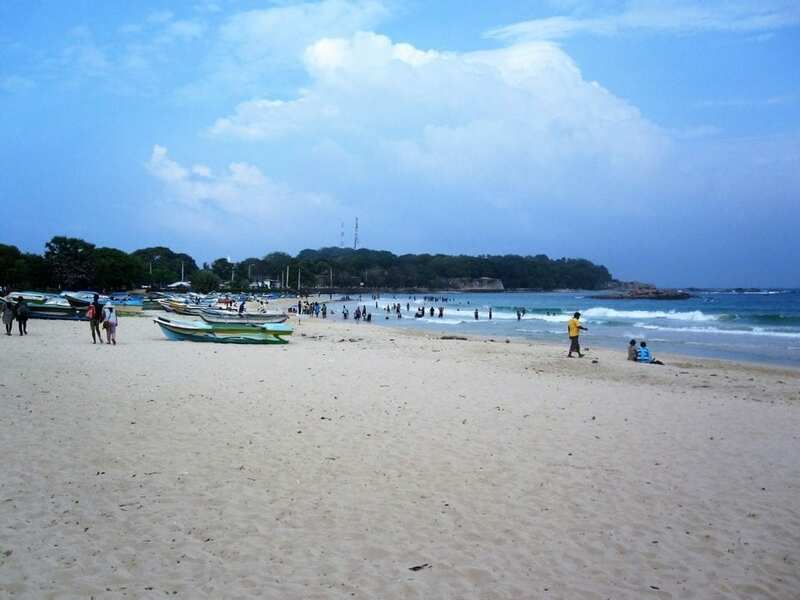 Residents are enjoying the beach in Trincomalee, Sri Lanka. Hambantota located on the southern coast of Sri Lanka is a thriving port. During the 2004 Indian Ocean Tsunami, the city was devastated. What remains after the tsunami is many salt flats dotting the seascape. I joined a group of five others and paid $60 to take a safari trip to Bundala National Park. On our tour, we spotted a variety of wild, native animals, including elephants, eagles, monkeys, water buffalo, egrets, turtles, and many bird species. By the way, if you are a bird watcher, Bundala is a bird watcher paradise, because of the wide variety of birds here. The park is a UNESCO Biosphere Reserve and teems with wildlife. 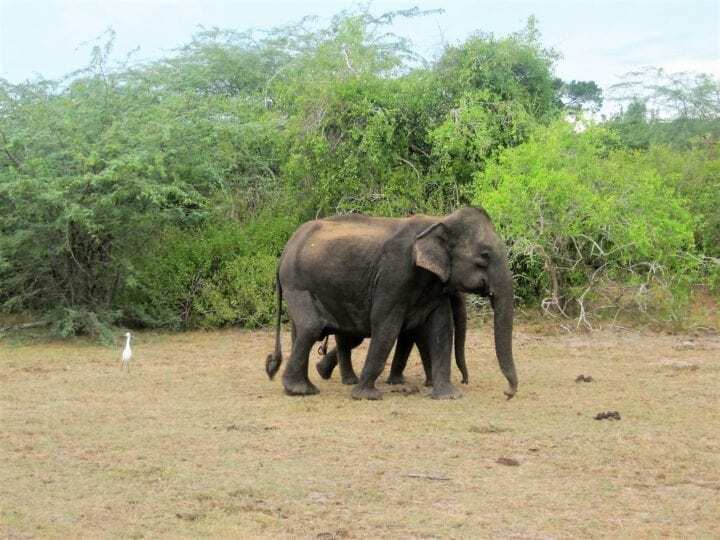 It is a fantastic experience because the park showcases the eco-system of Sri Lanka, over acres of marshes, dry scrub acacia trees, and brushes. The trip ends at the southern edge of the park boundary, facing the Indian Ocean. Elephants at Bundala National Park, Hambantota, Sri Lanka. The Republic of the Maldives, a Muslim nation, makes up a group of some 1200 coral islands and is located off the southwest tip of India, in the Indian Ocean. It is the world’s lowest country. Most of the islands are uninhabited. Male’s inner harbor is bustling with water taxis that service the resort islands. 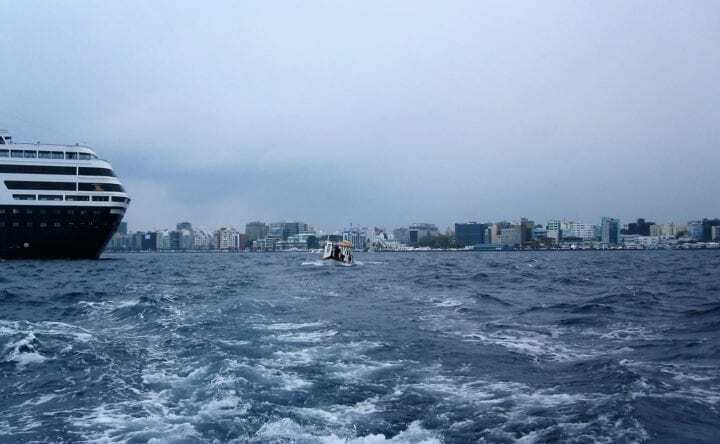 Male is the capital and most populated city in the Republic of the Maldives. About 133,00 people live in an area of about 2.2 square miles making Male a very congested place. Take a short walk on the streets of Male and admire the jumble of colorful buildings and narrow streets. I paid $75.00 to take a three-hour excursion to two reefs about a mile from Male but, within sight of the cruise ship. The operator provides masks, snorkels, fins and life jackets. During snorkeling, I spy parrot fish, butterfly fish, surgeon, and many other species swimming the reefs. Hues of Purples, oranges, blues, yellows make the reef sparkle. I saw a few black-tipped reef sharks too. The water visibility is remarkably clear. Swim over the reef’s drop off, and see schools of fish appearing from the depths. Utheemu is a tiny island in the Northern Maldives about 200 miles north of Male. Tourists can walk across Utheemu in just a few minutes, and circumnavigate, the whole island in about 45 minutes. 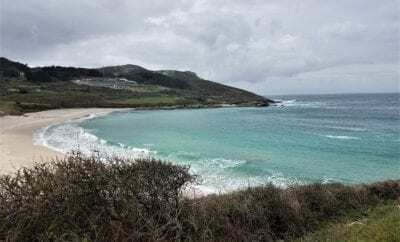 The warm water is crystal clear, and the beaches have soft, light-colored sand. One part of the island is a small rocky beach. The swimming and beachcombing last about a half day. I couldn’t believe I had the fortune of seeing and experiencing this place in person. Utheemu, Maldives. An equatorial paradise. The cruise departs Utheemu and cruises the Laccadive Sea to Colombo. While sailing this leg, the sea lanes as this sea channel are a sea highway for the Laccadive Sea. A group of us paid a taxi driver $25 each, for a 45-minute drive to Machincang Mountain. 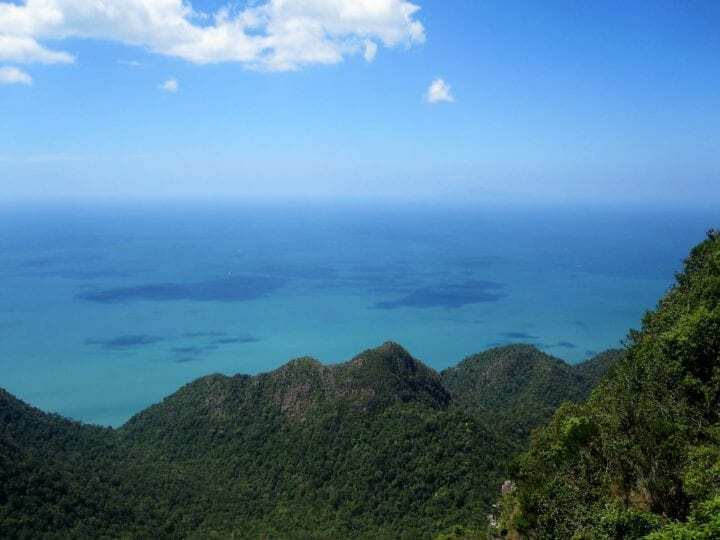 The mountain offers impressive views of the surrounding mountain range and many small islands dotting the tropical waters of Malaysia. A cable car takes tourists to the top of the overlook for approximately $50 each person. Most importantly, remember to buy the “express” ticket to jump to the front of the line. Langkawi, Malaysia. From the top of the cable car. It’s one of the steepest cable cars runs in the world. From the top of the cable car, the views are spectacular. If you are afraid of heights, beware, it’s one of the steepest cable car rides in the world. An overnight cruise from Porto Malai brings the cruise ship to Port Klang by morning. Port Klang is the gateway to Kuala Lumpur, Malaysia’s capital, a city of about 2.5 million people. We took a taxi tour at Port Klang. 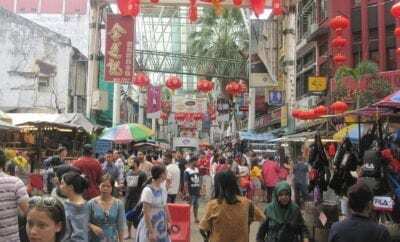 If you have four people, hire a taxi for $25.00 each, for a six-hour trip around Kuala Lumpur. Batu Caves are part of our guided tour. The caves are limestone outcropping outside of Kaula Lumpur. The Batu caves comprise of three main caves and several smaller ones. 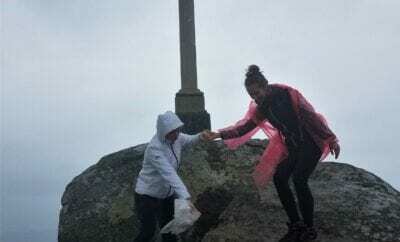 Climb to the top by walking along a steep cement stairway with 272 steps. During this section of the trip, visit the Petronas Towers, at one time the world’s tallest buildings. The buildings seem to sparkle like diamonds in the equatorial sun. Outside the towers, there’s a beautiful park with bamboo and other tropical plants. It is a peaceful place to take pictures and relax. Also, close by, there is a gigantic mall. Inside the mall, for those who like to shop, there is plenty to chose from, and it’s air-conditioned. After that, stop at the King’s Palace. Malaysia’s ruler is a king and lives on the compound. 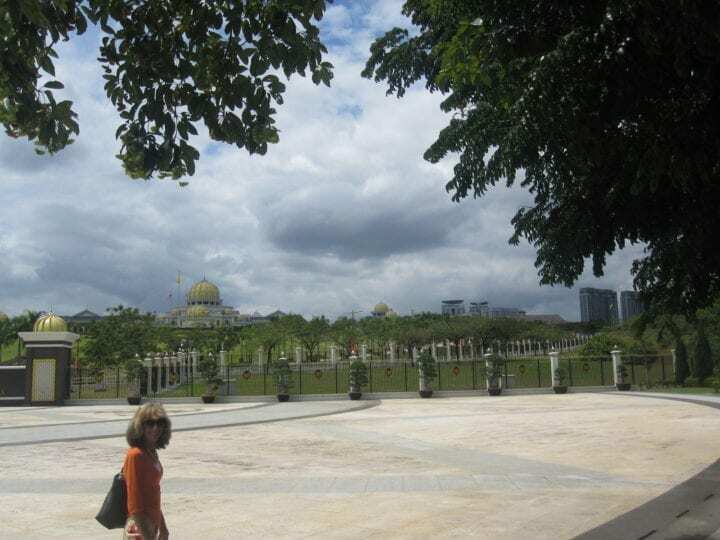 Tourists admire the magnificent Islamic architecture and manicured grounds. I can’t imagine what the Palace looks like inside because visitors aren’t allowed inside. The King’s Palace outside of Kuala Lumpur. In Chinatown, I had a fantastic spicy bowl of soup for $4. The hot and savory soup seems to cool me on this hot day. Remember to sample various regional ethnic foods. The local dishes are delicious and seem best when prepared by local chefs. Eating new foods is the best parts of travel to me. The ship departs from Port Klang at 5:00 p.m., cruising overnight, arriving in Singapore by morning. Back in Singapore, with lots to see, I saved some time on the trip to do more sightseeing in here, before I fly home. Travel Tip: Travel is about culture and people, as well as the beautiful world destination and sites. We also travel to Singapore, Thailand, and the Maldives. If you want information about the total Holland America Experience or the itinerary for this cruise select any of those posts. If you need help planning for your trip, we have The Best Recommendations for Planning. Hello, my name is Jim. I live in Bellevue, WA. I'm a solo traveler, who loves budget travel. Any adventure is good if it's cheap. I like to tag along with other people if they help do the planning. Drench my food in hot sauce, lettuce is my primary vegetable, I eat to live. I have no pets.